New Orleans Marriott at the Convention Center Now Featuring the Sleep-In on the Weekend Stay. Is Europe out of reach this summer because of the weak dollar, unprecedented gas prices and rising airfares? No worries. The New Orleans Marriott at the Convention Center is offering guests a cost-effective alternative and is extending an invitation to America's most European city, starting at a mere $89 per night. Simply book a Friday or Saturday night Sleep-In Weekends stay and enjoy this unbeatable New Orleans hotel deal, from $89. This Big Easy vacation offers jetsetters a European-like ambiance without the big European price tag. The incredible rate is valid now through December 31, 2008, based on double occupancy. Centrally located and in close proximity to the famed French Quarter (talk about European, oui, oui! ), Canal and Bourbon Streets, this Port of New Orleans hotel is the place to be if you can't make afford a European getaway. Why do people call New Orleans America's most European city? The city's European flair dates back to the early 18th century when the Spanish owned the city, influencing much of its architecture, and the French, who settled in New Orleans, began building the Vieux Carré, or the French Quarter. Modern-day NoLa has embraced its European background and it's evident in the streets of the French Quarter, the Spanish wrought iron fences featured on houses and buildings, the French-inspired cuisine, the laidback attitude and more. The Sleep-In Weekends stay also includes free parking and a five p.m. late checkout time. 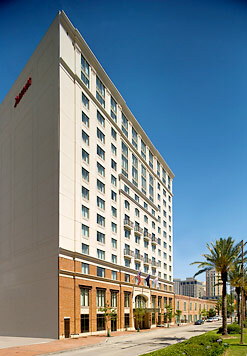 For more information or to book this exclusive summer rate, call 1-888-364-1200 and ask for rate code ADV or visit http://neworleans.marriott.com. Located in the Warehouse/Arts District, this New Orleans riverfront hotel is across the street from the Convention Center and Port of New Orleans, as well as within walking distance to the French Quarter, Harrah's Casino, and the city's finest shopping and dining establishments. Housed in a former cotton mill from the mid-1800's, this riverfront hotel in New Orleans expertly combines classic antiques with modern amenities and trendy decor. Indulge in luxurious New Orleans vacation accommodations, as well as fine dining at Wolfe's in the Warehouse featuring exceptional Creole cuisine prepared by celebrity chef Tom Wolfe. Take advantage of the fully equipped business center and 24,464 square feet of flexible meeting space designed for corporate events. For more information or to make a reservation, call 504-613-2888 or visit http://marriott.com/hotels/travel/msymc.